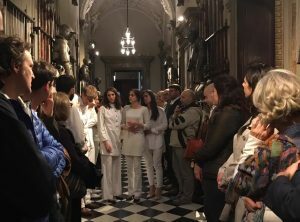 Spring means the return of Thursdays at the Bagatti Valsecchi Museum: evening hours during which the house becomes, again, a home thanks to performances, concerts and conferences (all in Italian). Directed by Mauro Avogadro, the students of the Scuola di Teatro Luca Ronconi will fill the rooms with characters and voices. Carlo Goldoni, Luigi Pirandello, Tennessee Williams, and Paolo Ferrari all come to life, alternating with protagonists of their most important pieces, from Six Characters in Search of an Author and A Streetcar Named Desire to thematic evenings. The evenings dedicated to literary greats alternate with ones in which the young actors interpret – not completely seriously – lessons in good manners inspired by the etiquette book of Monsignor Della Casa. Good manners and the disapproval of vices will be recounted with irony and sarcasm in some of the most beautiful rooms of the noble Bagatti Valsecchi home. Every Thursday beginning May 4, the Luca Ronconi Theater students will hold two performances. On the 4th and 18th of May, the event will unfold as the rooms are traversed (two departure times). On the 11th and 25th of May, it will be possible to discover the collections and rooms of the museum before the event on one’s own or with a guided tour in Italian at 7 P.M., while the event will be held in the Grand Salon starting at 8 P.M. These events have been made possible thanks to the support of the Region of Lombardy and the Cariplo Foundation, as well as the generous support of the Friends of the Bagatti Valsecchi Museum Association. May 4, May 18 > 7 P.M. and 8 P.M.
At the Bagatti Valsecchi home with the etiquette book of Monsignor Della Casa. May 11, May 25 > 8 P.M.